Irvine, CA (May 19, 2016) – Janes Capital Partners is pleased to announce the sale of AC&A, LLC to AE Industrial Partners. Located in Lake Forest, California, AC&A is a manufacturer of composite and metallic parts and tooling for the aerospace and defense, space and niche and specialty automotive markets. The company is a leader in complex tooling design and development in addition to advanced composite part manufacturing for high-growth end markets such as space and UAVs (unmanned aerial vehicles). AE Industrial Partners, based out of Boca Raton, Florida, is a private investment firm focused on the aerospace, power generation and specialty industrial markets. The investment into AC&A was made from the firm’s recently raised first fund of $680 million, AE Industrial Partners Fund I LP. 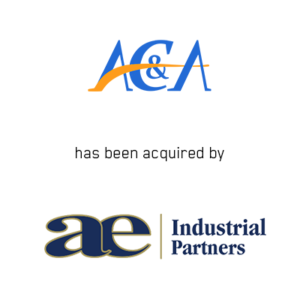 AC&A represents a platform investment for AE Industrial, whose other platform investments include Belcan, supplier of engineering project management services and technical staffing, and Kellstrom Materials, provider of parts, parts support and supply chain management for airlines and air transport operators. Based in Irvine, CA, Janes Capital Partners is a leading boutique investment banking firm focused solely on the Aerospace and Defense industry. The firm provides mergers and acquisition advisory services and assists clients in executing growth strategies and liquidity events. With a cadre of former bulge bracket investment bankers, successful A&D executives, skilled engineers and decorated military personnel, the members of Janes Capital Partners have completed more than 50 successful A&D transactions and $4 billion in closed transaction value. Securities transactions are conducted through JCP Securities, Inc., a registered Broker/Dealer, member FINRA/SIPC, and registered Investment Advisor.